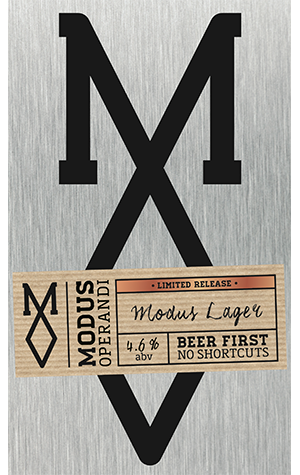 In something of a surprise move, Modus Operandi has brewed a lager. That’s not to say that they were ever lager-averse – in fact, considering the clientele around their Mona Vale home, you can imagine their locals would have been right into it from the beginning – but that they’ve had such a fast start to brewery life and their beers are in such healthy demand that you can’t image them having the capacity to let a lager sit around and take up valuable tank space. Yet they’ve decided to make room. The beer is slightly Bohemian by heritage and the same in nature, an Old World meets New World blend where the classic crispness is taken up a notch or several by way of some judicious hop additions. Having had a wee sample a short while before its launch, the beer had a malt softness that careened into ample citrus character and a clean and dry finish. In keeping with the simplicity of the experiment, there are no fancy names or mysterious references in the name of this beer. Instead, Modus Lager just delivers what it promises.